In Europe there is currently an increasing public awareness of the importance that demographic trends have in reshaping our societies. Concerns about possible negative consequences of population aging seem to be the major force behind this new interest in demographic research. Demographers have been pointing out the fundamental change in the age composition of European populations and its potentially serious implications for social security schemes for more than two decades but it is only now that the expected retirement of the baby boom generation has come close enough in time to appear on the radar screen of social security planners and political decision makers to be considered a real challenge and not just an academic exercise. In Austria this new development has motivated the Academy of Sciences to greatly expand and internationalize its Institute of Demography which has been in existence for 25 years. The main idea behind this new effort is the understanding that today demographic analysis only makes sense if it aspires to be at the cutting edge of the international scientific debate. Taken seriously, this aspiration also challenges the traditional organization of demographic research in Europe which still functions largely along national lines although neither demographic knowledge nor demographic trends tend to stop at national boundaries. As a consequence this institute, now known as the Vienna Institute of Demography, sees itself as a European center of excellence in demography, based in Vienna and funded by Austria but not a traditional national institute. 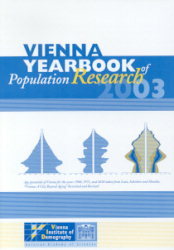 Its research is structured into four areas: comparative European demography, population dynamics and forecasting, population economics and analysis of demographic trends in Austria.